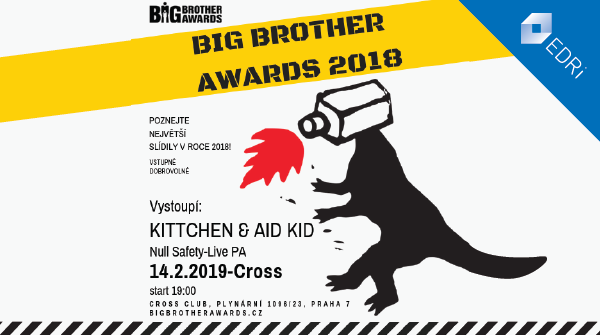 The 14th Big Brother Awards (BBA) in the Czech Republic will take place on 14 February 2019. Awards for the biggest privacy intruders in 2018 will be announced by EDRi member Iuridicum Remedium (IuRe). The Big Brother Awards, based on a concept created by EDRi member Privacy International, are intended to draw public attention to privacy issues and alarming trends in data privacy. In addition to the Awards for the privacy intruders, there is also a positive award, named after Edward Snowden, that goes to people or projects that stand for the privacy issues. The 2017 Awards were given to Ministry of Industry and Trade (for data retention), to Equa bank (for forcing its clients to agree to provide the so-called TelcoScore), and to Member of the Parliament Jiří Běhounek (for his proposal for an amendment to the Act on Health Services that introduced an unrestricted access to electronic healthcare documentation). The positive Edward Snowden Award went to Open Whisper Systems (for developing the open source Signal application for end-to-end encrypted mobile communication). The winners of the 2018 Awards will be revealed during the press conference on the morning of 14 February at the Cross Club Café Prague and announced in the Czech BBA Awards website. The post Czech BBA nominates the worst privacy intruders for the 14th time appeared first on EDRi.